The hill in question would be Beacon Hill, in Boston. There aren’t many high elevations in Boston, although there are plenty of hills. If any part of Boston does not go underwater due to climate change, it will probably be the neighborhood of Beacon Hill, home of the Massachusetts state capitol, which also includes the governor’s executive offices. (Massachusetts does not believe in governors needing a mansion). Older even than the government of Massachusetts are various Unitarian churches around here that predate the revolution. We saw one in Cambridge today that was started in the 17th century. We Unitarians got an early foothold in the New World in Boston, and we got premier real estate when it was still cheap. So the Unitarian Universalist Association holds some historic digs up here on Beacon Hill, including the Eliot and Pickett House on Mount Vernon Court. The Eliot House contains offices in the basement, meeting space on the first floor and guest quarters on the upper levels. The guest quarters are sort of like a B&B. In any event they are dirt cheap for Unitarian Universalists (UUs) to rent who are visiting Boston, a mere $120 a night that includes breakfast privileges and (since it’s a UU place) all the coffee you can guzzle down in the morning. You have to make your own breakfast, but the kitchen is reasonably well stocked, and the rooms are small, clean and quite nice but don’t seem to include maid service. The Eliot House where we are staying is truly right at the top of Beacon Hill. I look out our window and fifty feet away is the state capitol, with office lights burning brightly during the night. So we are feeling a bit smug. Rooms, if you can get them in downtown Boston in the summer, typically go for twice as much, and you simply cannot get a better location in Boston, just two blocks from the Boston Common. I expected though that this UU hotel of sorts would be overrun with penny-pinching UUs, but the place is eerily empty at night. I am pretty sure we are the only official guests here these last three nights, leaving dozens of excellent guest rooms in a prime location rentable but unoccupied. We would be alone except for one caretaker who is here to 11 PM. The Unitarian Universalist Association needs to do a better job of marketing the place, because the rooms are nice and clean, the location cannot be bettered and the cardiovascular opportunities getting to the top of the hill are excellent. Its only minus is the lack of parking, requiring $26 a day at the local Boston Common garage several blocks away. Boston is hardly unknown vacation territory to us. We have been here twice on vacation before, and my wife comes up here annually for a convention. So we have seen most of the tourist sites and are working our way through some of the less popular ones, like the Paul Revere House. Given that overall Boston is such a great city, it’s no wonder that we would like to relocate to be close to it. So yesterday we found ourselves in the Boston suburb of Watertown (in the news recently as the location where the Boston bombers lived) talking to a local realtor about the price of housing around there to see if it was affordable. The long and short of it was probably not. We probably could find something we could afford, but it would probably not be big enough for our needs and would come with other less desirable aspects. We’d probably be in a duplex, we’d likely be close to rental housing and all the hassles that brings, and we likely would not have the luxury of a garage. This was in Watertown, ten miles or so up the Charles River. Our ideal location would be Cambridge, in one of those lovely high rise condominiums that line the Charles River. The realtor suppressed a smile. For some place that met our criteria we’d have to pay close to a million dollars, and our house is worth only half that much. There is also Boston’s crazy real estate market, modeling the Washington area where we live at the moment. It’s a sellers’ market, so properties are expensive, don’t stay on the market long, and are the subject of intense bidding wars. In short, it is probably not worth the expense, tradeoffs and the hassle to live close to Boston. Boston though still remains a neat city. More exposure to it only leaves me more impressed with the city. Aside from its high cost of living, it has few downsides. I complained about the lack of ethnicity in Northampton. That’s certainly not a problem in Boston, where you can find every color in the rainbow and many in between. As in Washington, you will hear about half the conversations in languages other than English. It can credibly claim to be the most educated city in the country. Harvard and MIT are the well-known universities but there are many dozens more, so the city is infused with a highly educated workforce tending toward being younger rather than older. Boston has the most attractive downtown of any major metropolis I have seen, and it is easily walkable. If it is too far to walk to your destination, while its subway and bus system may be very old, it is convenient and cheap. It has this plus all the amenities of a big city, minus most of its downsides. Boston of course is the city but it is surrounded by other cities and towns that make up a sort of inner Boston, and all sorts of communities further out that make up the Boston metropolitan region. Many of the streets have potholes. Much of its infrastructure is either in repair or needs repair. But it’s an old city that is paying the freight of maintaining an old infrastructure. Some things are unlikely to change. While mass transit moves people around, the roads won’t get any wider, so getting around by car is going to always be a hassle. Those are some of the compromises people make to live here. Mostly they are compromises people are willing to pay for. Overall you need deep pockets to live the Boston dream. Otherwise, like our friend Sian out in Cambridge, you have to get practical. You find roommates and rent a house and split the expenses instead. Houses and rent get cheaper further out from Boston. So a far flung suburb like Marborough is not out of the question for us. But that does raise the question of why we should move in the first place. Why trade life in the suburb around one big city for the same around another one? What we want in retirement is something different and more satisfying than what we have: either to live the urban dream or live a life closer to nature. It should offer less hassle as well. Financially, the latter option looks like the only viable one. Meanwhile, we can at least enjoy Boston while we are here. Our time here has included whale watching (we had four humpback whale encounters! 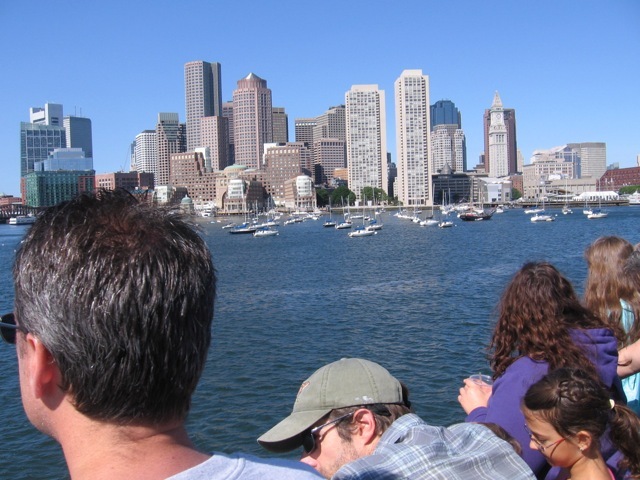 ), museum tours, walking around the Boston Common, dining in Little Italy and riding the T to various places. The Boston Common is such a delightful place to while away the hours. It is very much Boston’s Central Park and in some ways it is better. We can imagine living here off Mount Vernon Court on Beacon Hill, in one of these tall brownstone buildings full of overpriced condos and apartments. We just cannot afford to actually do it. 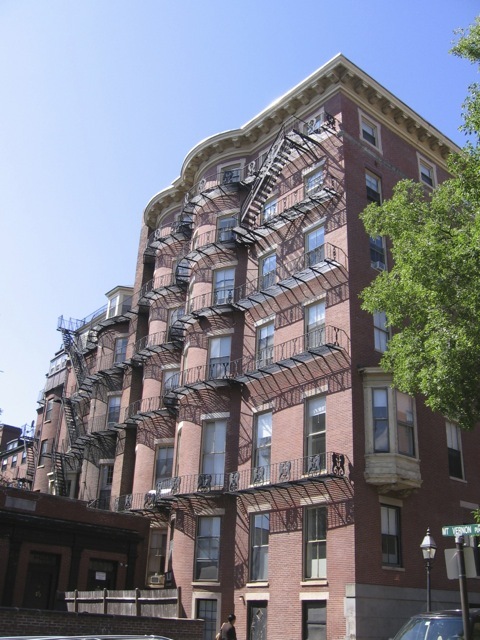 We can afford to visit Boston regularly, and I expect the Eliot House will be our choice of cheap digs again when we visit.